Upper Deck Retail in Huntington Beach will have its second anniversary this month. For the grand opening events Upper Deck hosted signings with Luke Walton and Steve Garvey. Both signings were free of charge and included Upper Deck Authentication. The appearances were scheduled on consecutive days. Luke Walton appeared the first day and Steve Garvey appeared the day after. 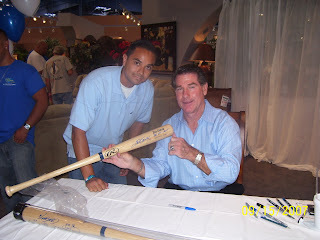 I only attended the Steve Garvey signing. I have not been to the Upper Deck store since the grand opening event. 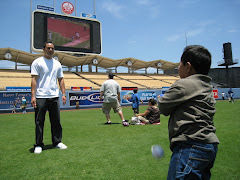 They host many autograph signings but charge a fee per autograph. I do plan on going back on March 6, for NBA Hall of Famer and Lakers legend Elgin Baylor. I figure if I pay, it's going to be for a Hall of Famer. I also did not make it to his last signing in Cerritos last year. A new promoter is now working with Upper Deck. They were having many complaints about the previous promoter. Hopefully it's a change for the better. 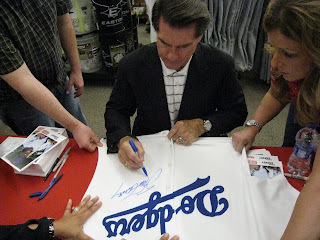 The photo at the top of the post is one I took of Steve Garvey at the grand opening event. I like attending his signings. All have been good experiences with no complaints.